Two things are true about the Internet of things: it's a fragmented mess and it's a target for hackers. The Foscam baby monitor hack reminded everyone that anything that's on a network needs to be secure and that includes your connected cameras, lights and fire alarms. Dojo Labs saw the security mess that's happening in our homes and decided instead of addressing the devices individually, it would keep tabs on the entire network and the traffic going in and out of it. The Dojo smart gateway tracks devices trying to connect to hardware inside your network and when one of those smart items, like an over-sharing television, is sending information outside the network. It does this in way that makes security easy for anyone to understand and manage with an app. Setting up the Dojo involves just plugging the box into your router and installing the app. The device automatically scans your network and analyzes and logs the items found. It then alerts you of any weirdness happening via the status lights in the pebble. The idea is that the rock can be placed somewhere you'd notice it in house while the actual security hub sits next to your router. When an intrusion is detected, the lights on the rock glow yellow or red depending on the severity of the intrusion. 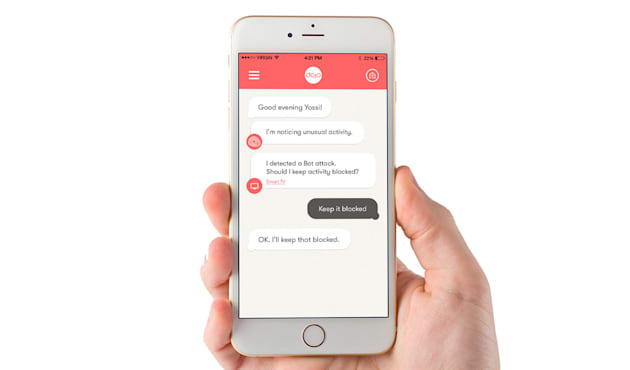 With the app, potential security threats are displayed as a conversation between the user and the system with pop-up choices about what to do about a potential problem. It also alerts you when a device is sharing information outside your network. For example, data being being shared by a device with a vendor or one of its third-party partners. "We are very pro IoT. We just want the user to have control over their privacy and security level and feel comfortable without the need to be an expert on the matter," Yossi Atias Dojo Labs CEO told Engadget. The company constantly tracks zero-day exploits and other security issues and pushes updates to the Dojo security cloud. It also uses machine learning and collected metadata from all the devices deployed to find and squash any new attacks. It insists that the devices don't share any information about the user or their network and says that it can't even access deployed Dojos once they are set up. In fact, it should be difficult for hackers to break into it as well because they won't know it's there. Once it's plugged in, the company says your network is now invisible to anyone on the Internet. Atias also told Engadget that it designed the Dojo from scratch so that no legacy security issues from off-the-shelf components will compromise it. But he and the company acknowledge that nothing is completely hacker proof. It's really about setting up the best wall to stop most threats. "There's nothing that's 100 percent secure. It's always effort versus value. This is very high effort for the value of hacking a consumer," Atias said. The Dojo is available for pre-order for $99 and includes one year of service. It will ship in late February/early March. After the promotion period, it will cost $199.